The Shonan Fujisawa Tokushukai Hospital was newly constructed and relocated to its current location to Tsujido-Kandai in Fujisawa from Chigasaki on October 1st 2012. 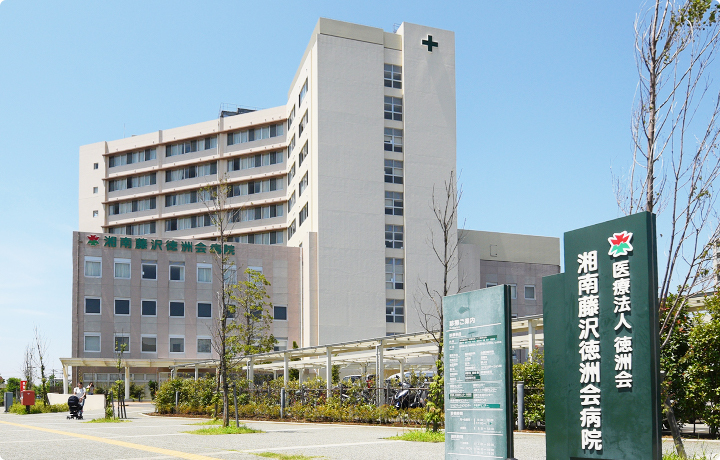 Our hospital has been providing medical services based on our policy of “Accepting any patients at anytime” for over 37 years in the Eastern Shonan Area. The hospital was newly constructed and relocated to its current location in Fujisawa in October of 2012. We are moving forward with the role of being a part of an “Acute Comprehensive Medical Institutions” with 419 beds. In order to confirm that we provide medical services properly, objective evaluation by third-party organization is the most effective method. Our hospital has been accredited by the Japan Council for Quality Health Care since 2003. In addition to it, we were accredited by the Joint Commission International (JCI) in August of 2016. The JCI accreditation is to evaluate that the hospital has a structure for patient safety, high quality of care and continuous improvement measures, and we became the 19th hospital in Japan to be accredited by JCI. Our hospital is authorized as a regional base hospital accepting international patients, based on the “International Patient Admission Environment Improvement Project for Medical Institutions” enacted by the Japanese Ministry of Health, Labour and Welfare. The International Medical Support Center has been established at our hospital and provides interpretation services for English. Telephone interpretation services for multiple languages are available. We are moving forward to strengthen the support system for international patients, and will actively accept these patients. One of our biggest goal is “A society where anyone could receive the best medical services with your peace of mind at anytime and anyplace.” In order to provide high-quality medical care at not only normal time but also the time of a disaster, it is necessary to continue to cooperate with the local medical associations and government. We strive to provide regional complete medical services cooperation with local hospitals, clinics and nursing homes. We are going to enrich furthermore advanced medical care services, preventive medicine such as medical and health check-up, home health services, and community lectures and programs as your good partner. Hospital staff provide safe and secure medical services to our patients, so that it is important for human resource development. Supporting the upbringing of the next generation who can contribute to society is one of the most important mission for us to work on. The latest medical technology, knowledge and skills are essential to provide medical services. However, continuing to care for our patients with all our hearts is more important than just having those technologies and knowledge. Based on our philosophy as bellow, we provide the best medical services to patients. We offer emergency and outpatient services 24 hours a day, 365 days a year so that anyone can receive the best medical care at any time. A patient’s safety and peace of mind is a priority to us and we strive to provide medical services with our patients’ satisfaction and trust in mind. We provide appropriate and timely information to our patients with informed consent, and also provide medical services with respects of patients’ right and will. We provide total medical and welfare services closely cooperate with medical and welfare facilities in the community. We profusely refuse unofficial payments, gifts, or any gratuities from our patients or visitors to ensure equal medical care is given to all of our patients. We aim to provide evidence-based medicine through the constant advancement of our skills and services.